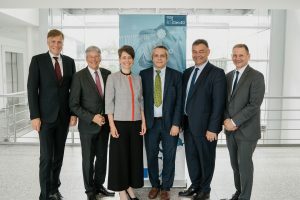 The European research project iDev40 was launched on July 14th 2018 under the leadership of Infineon Austria. In this project, 38 partners from six countries will be involved in research on the smart networking of development and production processes for electronic components and systems. With a project volume of 47 million euros, iDev40 is among the biggest European research projects with a focus on digitization along the entire value chain and Industry 4.0. Companies are facing the challenge of integrating all their processes in a globally networked, digital value chain. Those who use the digitalization in the right manner will make development, production and logistics faster, more flexible and more cost efficient. iDev40 aims at automating highly complex processes through methods of artificial intelligence and to train employees for the new tasks of the future. Intelligent data management provides secure access to information for people and systems. This makes it possible to deduce information and knowledge from huge amounts of data at high speeds. Development and production teams will be networked with each other, independent of their locations, and communicate in real time along the value chain. Processes can be virtually mapped by digital factory and product twins and can thus be simulated comprehensively. Artificial intelligence and machine learning play a central role in all of this. In the project iDev40 EVOLARIS is responsible for the prototypical development of a digital assistance system integrating mixed reality methodes and tools. An information system should be developed for the production department of AVL which shall provide and visualise unitesed information like production and assembly instructions, maintenance information, spare parts etc. to the whole value chain as „Single Source of Truth“.